It is a big day at Kodable! For the past three years, we have been working toward one goal: making it as easy as possible to teach programming in elementary school! Now we provide a complete K-5 programming curriculum to elementary schools. 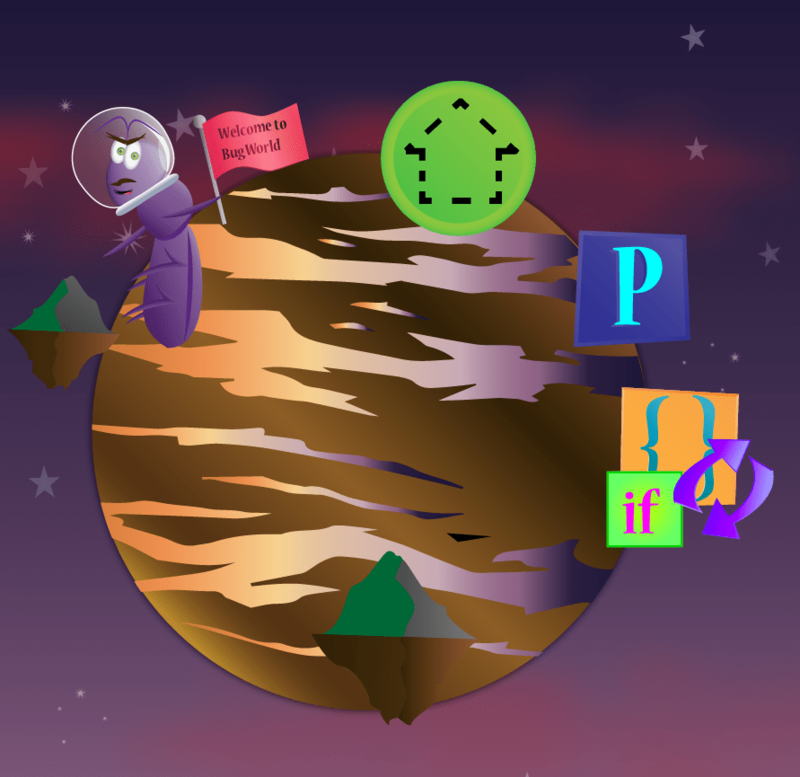 The Kodable 4th and 5th grade curriculum, Bug World, is now available! With the release of Bug World, Kodable is now the world’s first all-inclusive programming curriculum for elementary schools taking students from learning to think like a programmer in Kindergarten to writing real code by 5th grade. To celebrate, we’re making our 4th and 5th grade curriculum available for you to try with your students for FREE for the rest of the 2015-2016 school year! The Bug World lesson plans and student content we are teaching advanced concepts often included in the first semester of college for computer science students. These concepts are not out of reach for your students, however, is intended for upper elementary students, or those that already have a solid foundation in our earlier content. Your 2nd graders having completed earlier parts of Kodable should already code on a 5th grade level. Our Object-Oriented Programming Curriculum teaches real computer science in a way that makes it accessible for young learners. To make this learning process as smooth as possible, we highly recommend following our lesson plans before moving to on-screen content. We know that teaching computer science can be intimidating, but our mission has always been to make it as accessible to teachers without previous coding experience. This has never been truer than in our new content. The good news is that we’ve created some incredible resources, designed from the ground up by teachers, for teachers. Students will learn about these concepts off-screen and then take to their devices for independent practice. Your class will write classes, modify properties, make subclasses, and work with functions to engage in an exciting and dynamic program. Our curriculum and lesson plans are available now on your teacher dashboard. As with every other concept in Kodable, we have included complete, scripted lessons that you can dive into with your students. Feel free to give it a whirl this spring! It is available to everyone from now until June 31st, 2016. If your school is considering implementing coding on a K-5 scale, please feel free to reach out to us (support@kodable.com) about the scope and sequence of the Kodable Curriculum We’re happy to help you determine if it can fit your goals. Buckle Up Fuzzes: Now Flying into the World of Asteroidia! We’ve been rolling through mazes, and now we’re taking the fuzzFamily talents to space- let’s just say, the Kodable fuzzes have never looked so good. We are so excited to bring you the world of Asteroidia, and introduce you to the added concepts and lessons that you will use to build on your student’s coding instruction! Almost immediately after take off from Smeeborg, the fuzzes encountered all types of issues flying in space. Soon they were upon fields of multi-colored asteroids. The only way to clear the asteroids was to match them with their supply of fuzzballs! Taking their learning from exploring the Technomazes of Smeeborg and being excited to learn new skills, the fuzzFamily is now working together to fly safely through Asteroidia. Asteroidia, gives students the opportunity to have fun learning about how variables work. Every level gives them a group of asteroids that are blocking their ship from moving forward. To clear the asteroid field, students must match numbered (integers) and colored (strings) fuzzballs with like asteroids. They must select the matching variable in order to eliminate the asteroids in the way. As they progress farther into Asteroidia, students will be required to arrange their colors and numbers into arrays and launch them as an ordered list to clear the asteroid field. 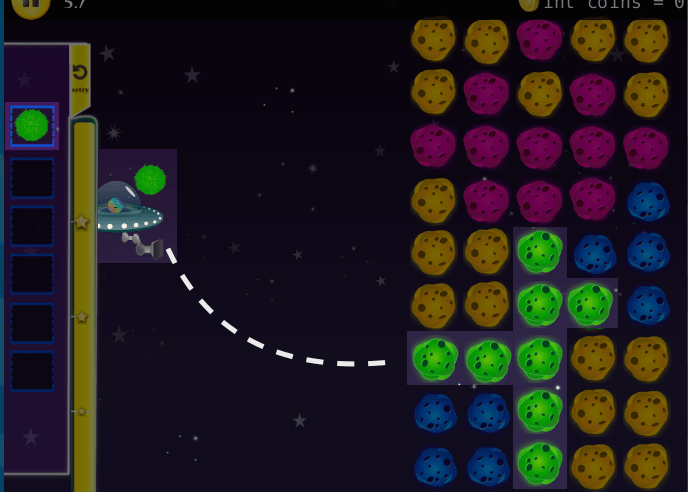 To fly their spaceships to the next level, students must match the colored and numbered fuzzes with the asteroids and launch them from their ships. 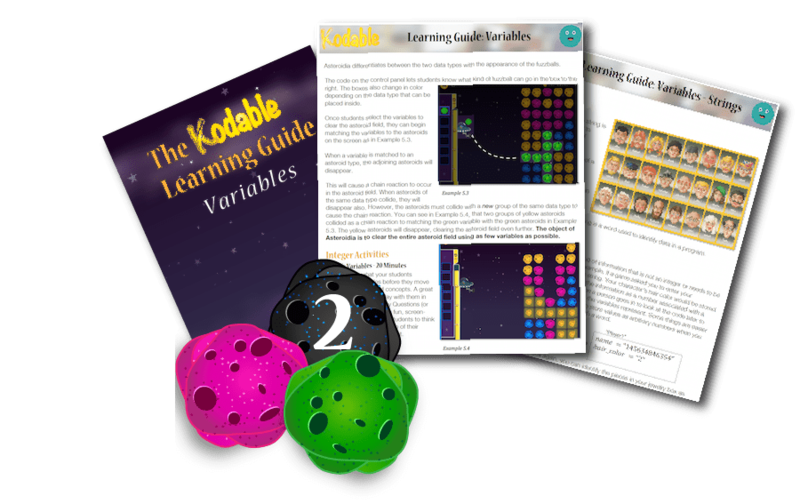 All of the new lessons in Kodable are accompanied with lesson plans, learning guides and screen free activities for easy curriculum integration. You can view the lessons from the curriculum page on your teacher dashboard. As we have fully shifted into being a K-5 coding curriculum, we’ve aligned our lessons with an end goal: students going through the Kodable Curriculum will be reading and writing code by 5th grade. variables– A variable is a container for information. Variables form the bridge between the foundational coding concepts we teach in Smeeborg with higher level concepts like object-oriented programming (coming soon!) that will enable students to directly read and write code. By matching, ordering, and grouping fuzzballs and numbers, students will successfully apply basic rules of syntax and variables to clear their way through Asteroidia, prepared to move into object-oriented programming. Like the progression of learning in any subject, the Kodable Curriculum begins with developing fundamental skills. Students using Kodable in grades K-2 begin with creating a foundation that will allow them to learn more abstract, complex concepts. With the world of Asteroidia bridging foundational skills and mastery, students will apply their knowledge of syntax and variables and get one step closer to reading and writing code. 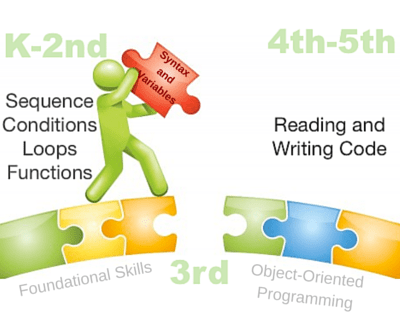 When students reach 4th and 5th grade, they will begin learning and mastering object-oriented programming, where computer programs are designed out of objects that interact with one another. We are so excited for you to check out Asteroidia and start getting familiar with the new material in the Kodable Curriculum! Make sure you stay tuned for our improved student login release, coming in the next few weeks. Reach out to support@kodable.com for additional support navigating our new features!